Gone to See Florida Road Trip. Day 13: Staunton, Virginia to Skillman, New Jersey. The drive took a bit longer than expected. Soon after crossing into Pennsylvania traffic came to a stop for over two hours. After getting home I went online and found out that a cattle truck went off the road. Thirteen dead cows and nineteen survived. Data from Landrover InControl: Drive time: 7:51; Distance: 352 miles; Avg Speed: 44.8 mph; Fuel used: 11.0 gal; Avg Fuel Consumption: 32.1 mpg. Time-lapse video recorded with a Garmin VIRB-360 camera (image every 2 sec). I mounted the camera on the dashboard with power via a USB power outlet. Images processed and video created with Photoshop CC and Premiere Pro CC. Gone to See America 2009 Road Trip. Day 3: Hays, Kansas to Green River, Utah. 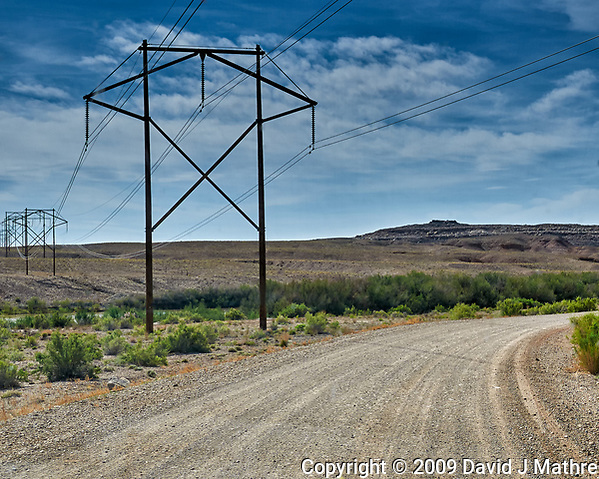 Power Lines Crossing the Road to Crystal Geyser Near Green River, Utah. Image taken with a Nikon D300 camera and 18-200 mm VR lens (ISO 200, 32 mm, f/10, 1/400 sec). Do a search for Crystal Geyser and Green River, Utah. It is worth seeing – a cold, carbon dioxide powered geyser. I have posted images of it erupting in the past. Road trip day as the group moved from Sedona to Williams, Arizona. I drove myself since I had my vehicle. Most of the others traveled in the four rented vans. I set up my Nikon 1 V1 camera and 10 mm f/2.8 lens on a tripod strapped down on the passenger seat to record a time-lapse video of the drive.